What's this? A second holiday collection from Color Club? Santa must have thought that I've been extra good this year, because not only is this second set of holiday colors sparkly, foily and glittery, it's scented. And not just the usual fruit scents, either. This one's way better than that. 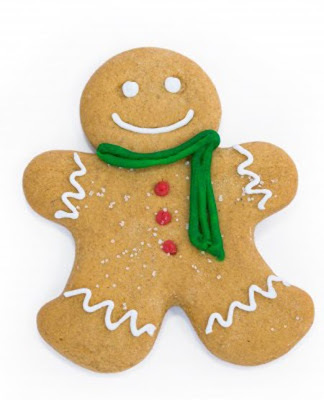 Color Club Gingerbread Man. This is your run of-the-mill gold foil. There's nothing really special about the color itself, though it is extra opaque, almost a one-coater. No, the special part of this one is the scent. It's gingerbread cookie scented. It's sweet, a little spicy, a little vanilla-ish and creamy, like a frosted gingerbread man. 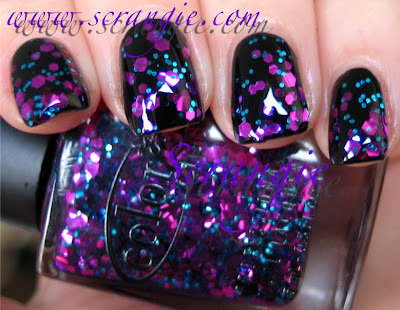 Color Club Kiss Me Mistletoe. A light blue-toned green foil. This one has to be one of my favorite scented polishes of all time. It's evergreen scented. It smells like a Christmas tree. I love it. Color Club Orna-Minted. 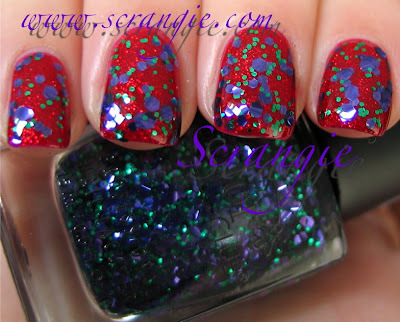 This is one of the three layering glitters in the collection. They don't look so great all by themselves, but they're very nice layered. Orna-Minted is a clear base with large and small silver hexagon glitter. It's peppermint scented. I remember quite a few years back, there used to be a wintergreen scented red and green snowman polish. Last time I remember wearing it was in the early or mid 90s. I remember hating the smell of it. Hah! This one I like as it's more candy cane than mouthwash. Weird name, though. Minte. Orna Minte. Just looks weird to me. Three people have verified that it is actually Orna-Minted, my bottle just has a printing error. Haha, no wonder it looked weird. Color Club Santa's Cinnamon. This is, again, not a unique color, but still pretty. Standard Ruby Pumps / Ruby Slippers red glitter in red jelly clone. My favorite way to wear red polish, actually. But this one is scented. It's cinnamon scented, and a really good cinnamon, too. Not like a Red Hots or Big Red gum cinnamon, more of a sweet, sugary, 'baked' type of cinnamon, like cinnamon cookies or apple pie. LOVE. Instead of swatching the other glitters by themselves, I did some layered swatches instead. They look better that way. 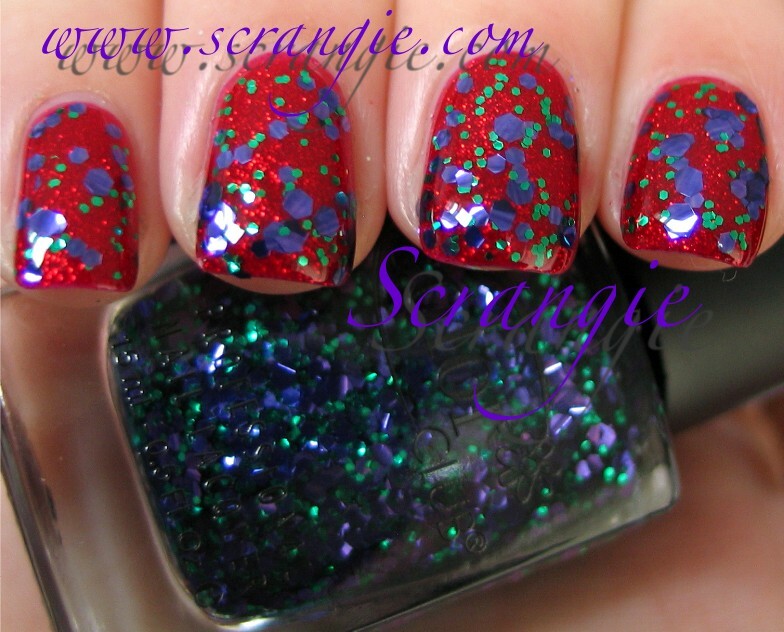 Color Club Very Merry Berry over Color Club Kiss Me Mistletoe. 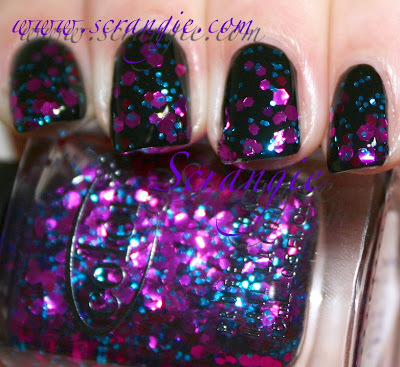 This is a medium-large pinkish-purple hexagon glitter and a small blue hexagon glitter in a clear base. It's berry scented. I do not like the smell of this one, it smells like medicine. Bleh. 'Berry' scents rarely smell good to me. Here it is over black for more contrast. One coat of Color Club Very Merry Berry over plain black creme. I think I like it best over black like this. Color Club Orna-Minted (one coat) over white. Looks much better layered than alone. Nice over dark colors, too. Color Club Sugar Plum Yum (one coat) over Color Club Gingerbread Man. This one is a winner. 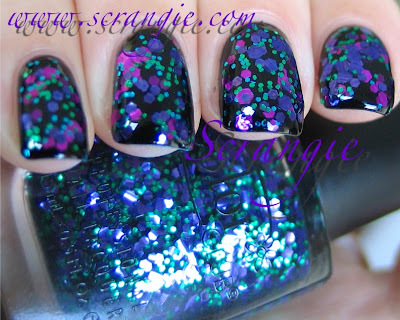 Purple and green hexagon glitter in a clear base. Plus, the scent smells super good to me. It's a slightly tart fruity scent, not too sweet, can't really compare it to any real fruit. More of a candy smell, like gummi bears or something similar. It's awesome. Color Club Sugar Plum Yum (one coat) over Color Club Santa's Cinnamon. Love this combination. Thought it would clash too much at first, but once I tried it on, I thought it looked really cool. Glitter over glitter. 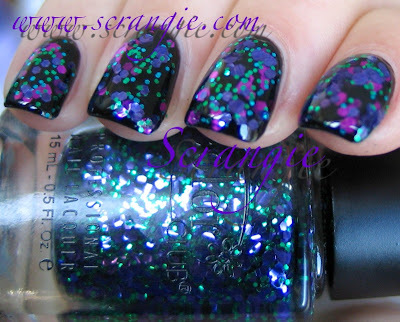 And, just for fun... Color Club Sugar Plum Yum over Color Club Very Merry Berry over black. Really like the glitter color combinations they chose for these two. Pink and blue and purple and green. Vibrantly colored, too, no pastel glitter here. The formula on these was great. I had no trouble with any of the colors. The chunky glitters in this collection are much thinner and easier to apply than the ones in Backstage Pass. I had no problem applying them in normal coats, they went on just fine, no clumping. I did two coats of everything except the layered colors. 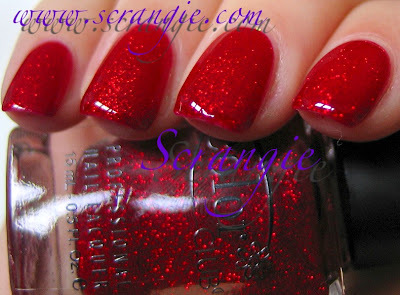 The foils were very opaque and the red glitter was perfect at two coats. Very fast dry time. The scents in these are some of the best I've ever tried. Maybe even the best. I really appreciate that they did scents other than fruit/candy smells. The gingerbread and cinnamon are delicious and the rest are just as amazing (except the berry, but I've always hated berry, so take that with a grain of salt). The only downside to these scents is that they're fairly faint and only last a day before I can't smell them anymore. With the previous Color Club scented polishes, they were pretty strong and I could smell them until I removed them. With these, I can only smell them when I hold my nails up to my nose and can't smell them at all by the end of the first day. I do wish the scents were stronger and longer lasting, and I wish they did slightly different colors instead of gold foil, pale green foil and silver glitter, but overall, I'm in love with this collection. I adore the scents and the colors are pretty good. Even though I probably have 25 red glitter jelly polishes like Santa's Cinnamon, I still love it. I love pretty much every red glitter jelly, even if they all look the same. Santa's Cinnamon is scented and the others aren't, so.... Maybe that's my new favorite. This collection is exclusive to Sally Beauty Supply stores through the month of December. It's not available at Sally Beauty online. OH I'm so jealous! Why can't we have cool things like that in the UK? It's not FAIR! :( They look gorgeous. I will NEED to get these. They're not as strong smelling so I may survive with this! Kittypolishnbags, they fade really fast, too, so you won't be smelling it for very long at least. Chelsea, haha really? That would make a lot more sense. My bottle is missing a letter! Hilarious! I never understood the appeal of scented nail polishes, but these colors are beautiful. I love your combination of Color Club Very Merry Berry over Color Club Kiss Me Mistletoe, it's wonderful! 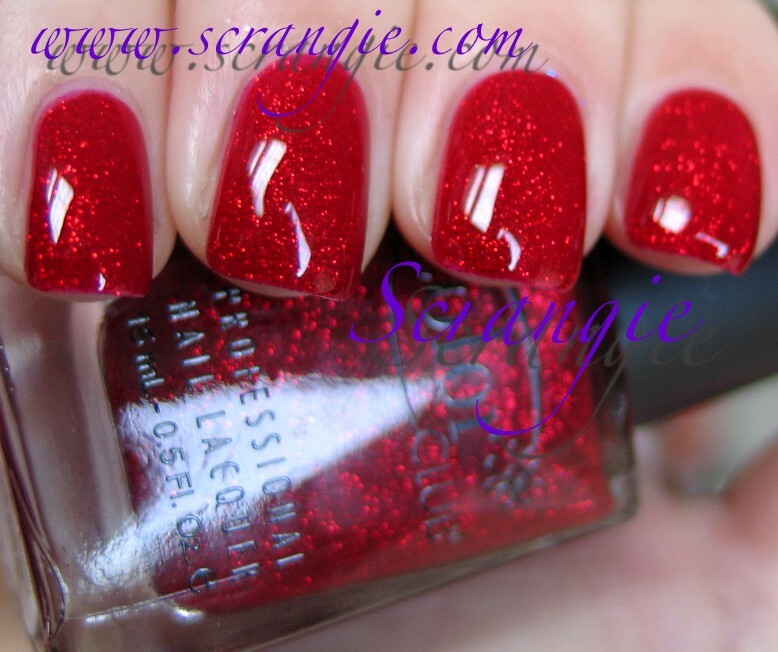 My favorite polish has to be Color Club Santa's Cinnamon. Maybe it's not unique, but I think it's an amazing red! I don't have anything like that in my (small!) collection. The "problem" with scented polish, is that I always smell my fingers!!! I just look like total creep, but I can't keep myself from smelling! I was so excited when I saw these at Sallys! My faves are the Gingerbread and Santa's Cinnamon, they smell so good! My favorite kinds of smells are sweet/spicy bakery kinds of scents anyways, so these were right up my alley. The Mistletoe one is great as well. I'm wondering if gingerbread Man works well for stamping I've only found two great gold stamping polishes! But if this is basically a one coater it's probably perfect! These are gorgeous colors! I hate scented polishes though, hopefully the scent wears off rather quickly! I bought the foily ones, but Sally's was out of the glitters. Thanks for the swatches and scent descriptions - I am going to try mine this week! Kcacka, yep! The scents sorta blend together and make a whole new scent, it's pretty cool! Wow, that's REALLY cool!!! =)) Thank you! LOVE those glitters over black. I think that'll be my next mani. Not really interested in them. Although I would like a Christmas tree scented polish. These are awesome. I'm really curious though--what top coat do you use with the glitters? I know Seche Vite is popular but I didn't know if you had something better. I'd also love to know what you use as a bottom coat. I have major nail polish chipping/peeling problems! As for basecoat, I use whatever I have handy- Qtica and Gelous are my top two, but whatever I use is almost always a nail treatment and not just a plain basecoat. If you're chipping and peeling a lot, there's two tricks to try. First, make sure there's absolutely no oil or moisture on your nails before your base coat- use pure acetone or rubbing alcohol to clean your nail plate, let it dry, then apply. Second, stop buffing your nails if that's something you do. Buffing them to a super glossy finish makes your nail too smooth and the basecoat and polish don't adhere properly and are more likely to peel off. Another main cause of peeling is trying to apply a quick dry topcoat like Seche Vite in a thick coat over an already dried manicure. Only use quick dry when the polish is still wet, use plain, non-quick dry topcoat if you need to refresh your mani. I like Gelous for that. How on earth did you get Sugar Plum Yum to lay flat. Its beautiful and I love it but it took four coats of gelous and seche vite to even get slightly smooth. How on earth did you get Sugar Plum Yum to lay down and behave? I have this and LOVE the colors but it took 4 coats of Gelous and seche vite to get it to not catch on everything and it was still super bumpy. 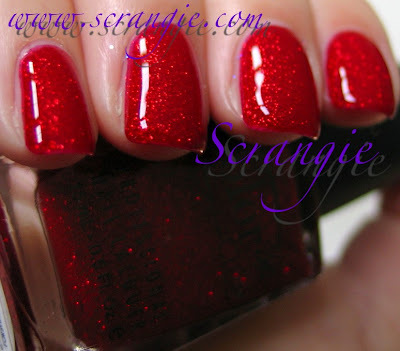 I'm picturing what a gingerbread-scented nail polish smells like, and that's heavenly! :) It's really refreshing to see a polish company come out with scented lacquer that isn't your typical fruity-scented one. :) Major points for originality! Thanks for swatching all of these! I don't know how you're able to swatch entire collections, but I reallllllly appreciate that you do it! 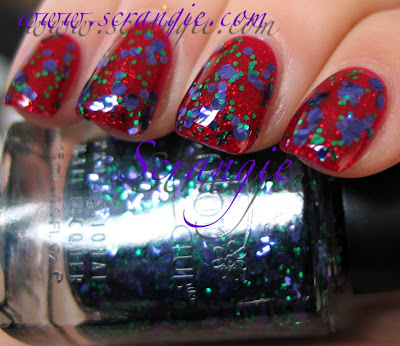 I normally can't stand glitter nail polish, but your layering makes them look so enticing! It's so cool that they're scented too! Interesting that Sally's had this CC Collection. It's the only time I have been anywhere that sells Color Club. I picked up Cinnamon and Mistletoe. Both are shades I will wear other than during holiday. Do you think they're still available? I just came back to Canada after being in Austrailia with family for December and January. Thanks!